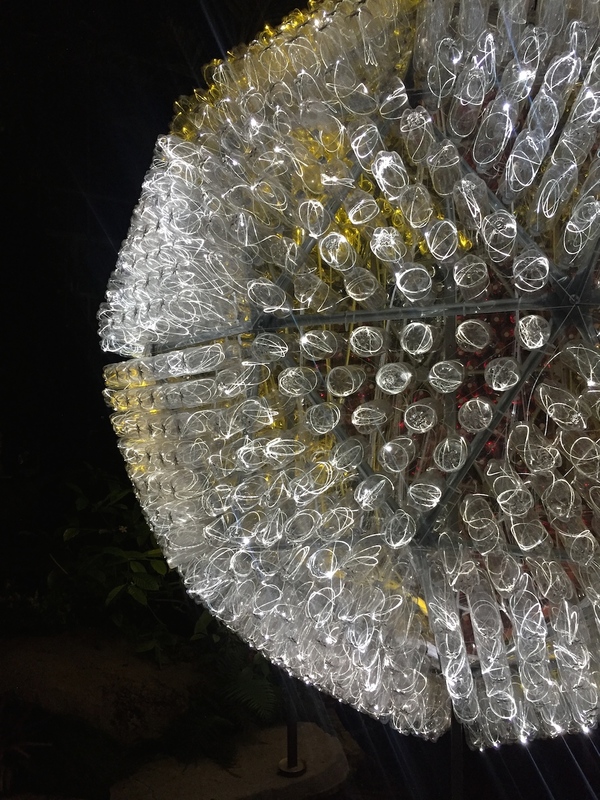 To celebrate its fifth anniversary, the Rockford, Illinois conservatory has an incredible collection of Monro’s twinkling light installations on display. This exhibit is the artist’s eighth large-scale installation in the United States, and includes eight uniquely glimmering sculptures. Some of the sculptures are only visible from the inside of the conservatory. However, there are also quite a few located outdoors along the public river walk. 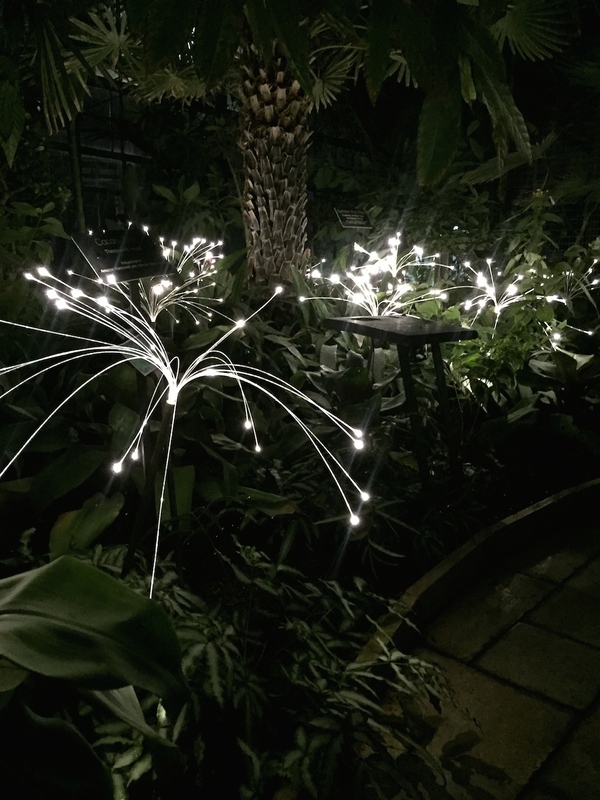 From flickering “fireflies” of light indoors to florescent flamingos honoring the creator of the ubiquitous lawn decor outdoors, visitors are sure to find a surprise around every corner. I also found it interesting that many of the sculptures have a unique sustainability component. Monro created a number of his pieces from simple reusable materials like plastic water bottles. 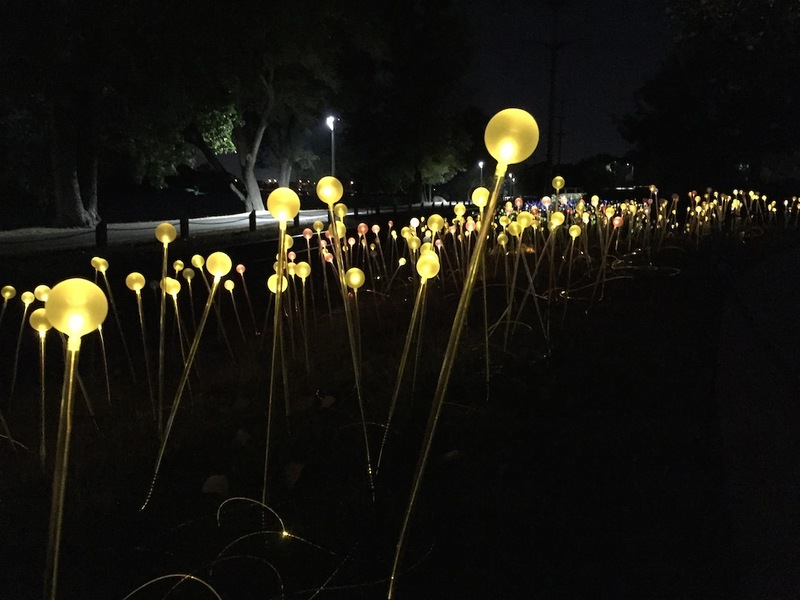 One of my favorite pieces was Field of Light, a collection of thousands of color-changing orbs that follow the river walk outside of the conservatory. 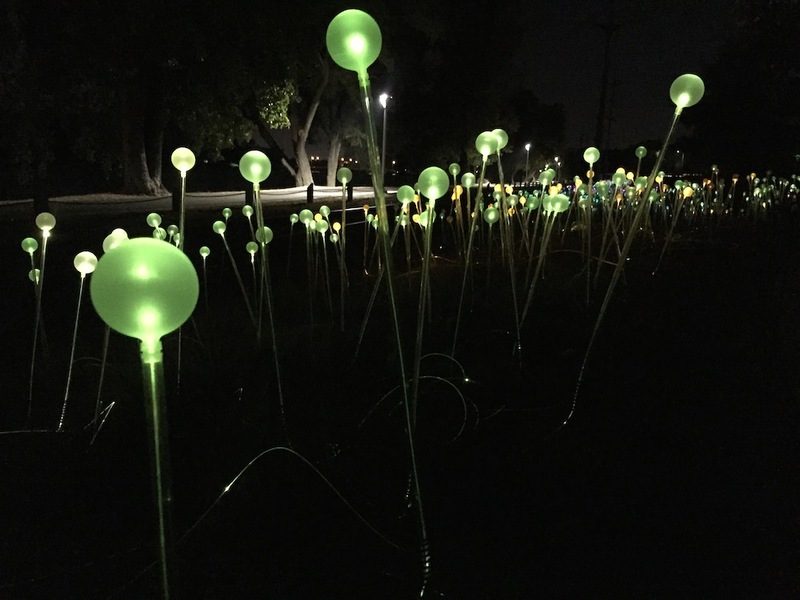 With more than 8,000 stems and 38.5 miles of fiber optic cable, this installation makes a beautifully glimmering impression along the Rock River. 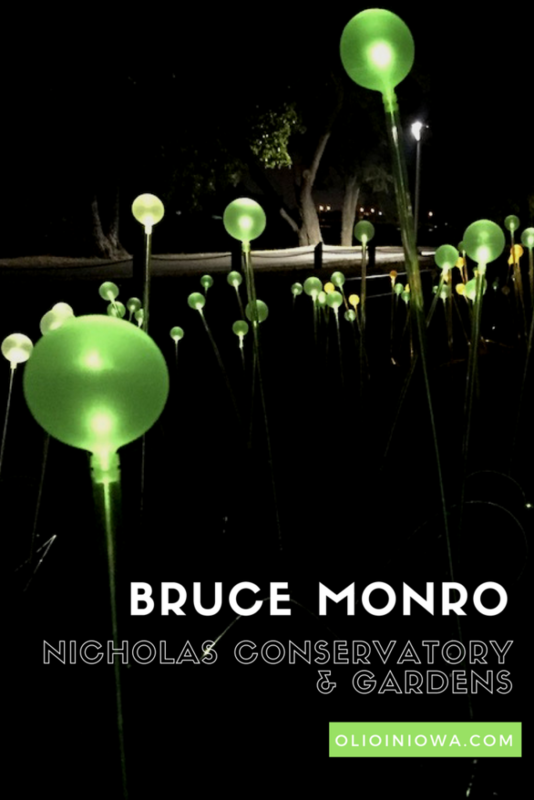 The exhibition Bruce Monro: LIGHT is on view at the gardens through Sunday, November 5, 2017. But even if you can’t make it to the gardens in time to see the shimmering display, you’ll still be able to experience a piece of the magic. 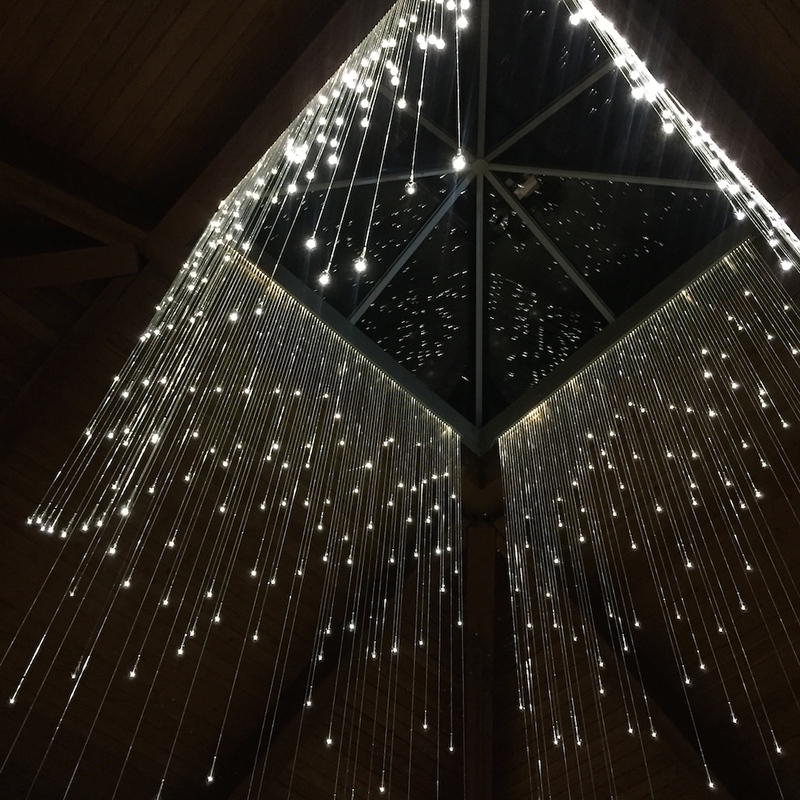 Monro’s piece Light Shower will remain in the conservatory’s atrium for visitors to enjoy after the exhibition ends. The gardens opened in 2011, but the area has been a fixture in the community for more than 100 years. In 1909, the Sinnissippi Gardens opened as Rockford’s first park. It was amazing to see how the area has evolved since. Located along the Rock River, the Nicholas Conservatory & Gardens offers a beautiful backdrop for exploring the area. The 11,000-square-foot conservatory is the third largest in the state and also includes outdoor fountains, waterfall, and rose garden. Thank you to Go Rockford and the Nicholas Conservatory & Gardens for inviting me to experience this beautiful installation!